The full length of studies in our program consists of one day a week for three years. For the last decade Dr. Uri Mayer-Chissick (Ph.D) has been working with communities all over Israel in order to get better food for families, to inform people about their food and to encourage all to support local farmers. We are now training Local Health Leaders. 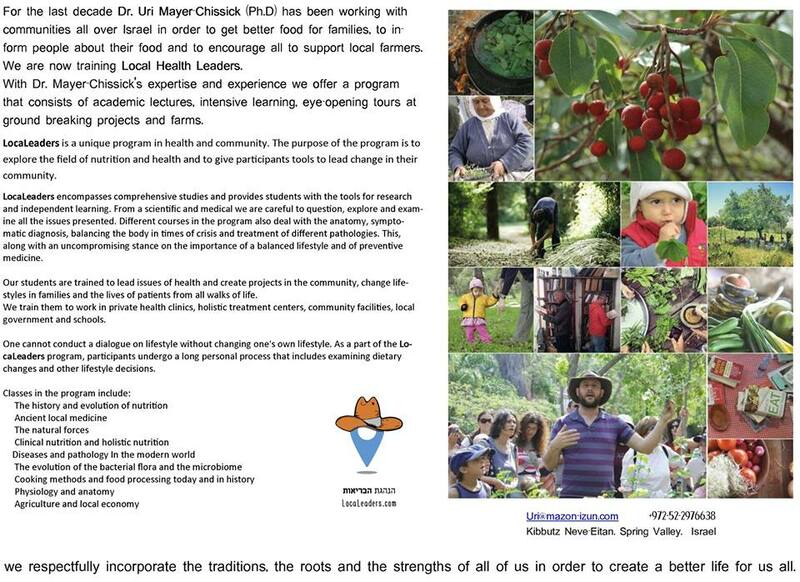 With Dr. Mayer-Chissick's expertise and experience we offer a program that consists of academic lectures, intensive learning, eye-opening tours at ground breaking projects and farms. LocaLeaders is a unique program in health and community. The purpose of the program is to explore the field of nutrition and health and to give participants tools to lead change in their community. LocaLeaders encompasses comprehensive studies and provides students with the tools for research and independent learning. From a scientific and medical we are careful to question, explore and examine all the issues presented. Different courses in the program also deal with the anatomy, symptomatic diagnosis, balancing the body in times of crisis and treatment of different pathologies. This, along with an uncompromising stance on the importance of a balanced lifestyle and of preventive medicine. Our students are trained to lead issues of health and create projects in the community, change lifestyles in families and the lives of patients from all walks of life. We train them to work in private health clinics, holistic treatment centers, community facilities, local government and schools. One cannot conduct a dialogue on lifestyle without changing one's own lifestyle. As a part of the LocaLeaders program, participants undergo a long personal process that includes examining dietary changes and other lifestyle decisions.